Here is the newest addition to our family, Countess Bella Von Abbey. 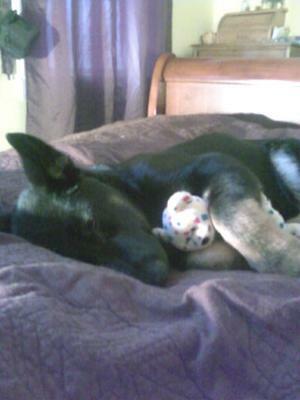 We are now the happy owners of two GSD’s, our other has her picture posted on your website. Our youngest daughter loves our other dog so much, she wanted to have a dog of her own that she could train and love. We welcomed Bella to our home in November and our dog Sativa is teaching her the “rules” of the house. She does not let her get out of line and makes her aware when she is doing a “no no”. We could sit for hours and watch them, they have brought so much joy to our lives. This is a picture after our daughter gave her a bath and brushed her teeth and it zonked her right out. She loves toys and as you can see, loves snuggling with them. That is without a doubt, one of the sweetest pictures I have seen - well, at least today (for sure). Bella looks to be an absolute honey!